In researching history about the town where I grew up, Google was ever so kind as to reveal this load of Cadillacs. This could be a preview of sorts to what may be a mega-article about the cars I remember from my hometown accompanied by an ample supply of vintage snapshots. Figuring out what to use will be the challenge. For what it’s worth, the bridge figures into the article as does a courthouse and a book from 1926 that was made into both a play and a movie. Abraham Lincoln even works his way into it as does the Mississippi River, seen above the hood of the Plymouth. How’s that for a teaser? Great picture. We gripe about the sea of silver, gray and black cars today. In 1970 it was a sea of brown, gold and green. That 55 Plymouth Savoy is significant – was one of those the first car you wrote up here on CC? If not it was close to it. Yes it was. I had completely forgotten about it! That would be a CC I’d like to read. Do you remember when it was posted? I tried searching but I could not locate. Thanks much! Cool, thanks! I did come across the CC Clue for the Y at the end of the Savoy, so now I have read the full piece. I did not realize it had been reposted, I probably read it last year myself. I miss those CC clues, they are fun. Interesting that the Cadillacs have their full wheel covers installed – rather than in the trunk as was more common, as seen on the vehicles riding behind the Cadillacs. I’m having difficulty identifying those cars. One upstairs almost looks like a Nova? Great photo. I remember many sights like these from when I was growing up in the 60’s and 70’s. It’s probably hard for anyone born after the 80’s to imagine that most vehicles were transported on open deck auto racks back in the day. a practice that is virtually unheard of today. This is a neat photo. The Eldorado and red Nova are a nice contrast. As a kid, my public school was located right beside a CP Rail line, roughly 250 kilometers east of Oshawa. I’d regularly see on recess, trains hauling late 70s full sized Chevys and Pontiacs. I recall seeing DeVilles and Sevilles occasionally as well. Assuming they were coming from Detroit. It was a real treat to watch them go by. 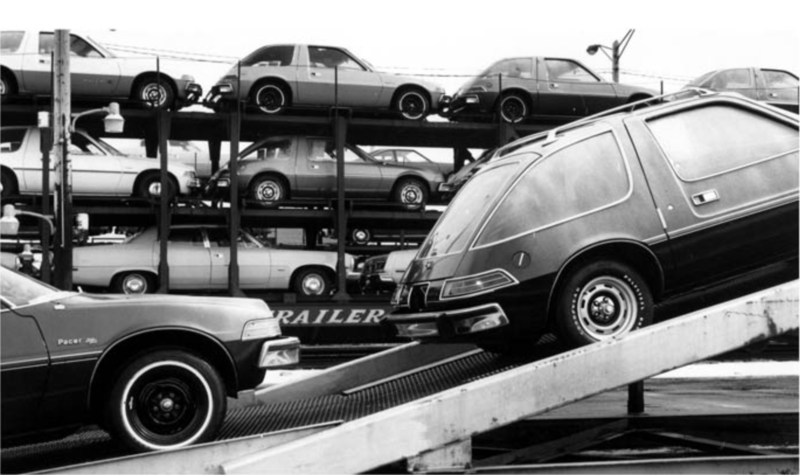 I remember the majority of cars being quite visible, without the metal privacy panels some car carriers had. They never had wheel covers, except for the odd car with styled steel or wire wheels. For that era, it was an attractive gallery of cars. The Holiday Train always slightly annoys me. They always have something in the newspaper “oh the Holiday Train came last night” but they never reminded us the day before. So when our kids were young I think we saw it once. I totally understand Doug. I saw the outdoor billboards in November, and made a point of going online to check the schedule then. I think the local media could do a better job promoting it a few days in advance. I didn’t realize they had multiple trains running through Canada and the US. Can’t say I ever heard of this before. It would be cool to see this some time. A most excellent picture! It needs a background music. I’m not sure if something Johnny Cash or perhaps Willie Nelson might be more appropriate. Or perhaps Springsteen? It’s a terribly predictable suggestion, but “City of New Orleans” by Steve Goodman. I think both Johnny Cash and Willie Nelson recorded it. Given the Cadillacs on board, the refrain “Good morning America how are you/say don’t you know me I’m your native son” seems appropriate to me, given Cadillac’s current position. Had they been Oldsmobiles, maybe “Wreck of the Old Ninety Seven” could have been tweaked to suit. Great article, I remember most automobiles being shipped by rail in open cars in the ’60s but they rapidly switched to covered cars to prevent theft and vandalism. Same in Britain sadly. As cars got lower in the ’60s new double deck carriers were designed to carry cars. by the ’70s theft of car parts (especially radios) was becoming quite common as well as incidents of vandalism (bricks from bridges, etc.). Not that they all got away scot free. It wasn’t unusual for thieves to be electrocuted when the trains ran off a diesel line and under over 25kV overhead wires. What struck me is that in 1970, the date of the photo, a fifteen year old car such as that 1955 Plymouth would be considered ancient, seldom seen in daily use. But now, at least in California and in other favorable climes where vehicles do not rot away from human-induced tin worm infection, cars that old are commonplace. It is not just the Asians, known for reliability; fourth generation Ford Taurus, early-2000s Chryslers, particularly minivans; and Chevys, too…the same kinds of everyday cars as a 1955 Plymouth when they were common. True, older cars are much more common these days and seem to blend in more , the styling changes are not nearly as dramatic as they used to be. Maybe its just me….. today’s 15 year old cars still look up to date and pleasant to me. I often wonder what it was like to see a 1935 car in the mid 50s, or something like the Ford Popular 103E, which looked prehistoric when they stopped making them in ’59, in the mid 70s. Then again, I never batted an eyelid when I saw a Mini or a 2CV in the 90s, or even a Morris Minor really. Partly it’s us getting older*, but rust-proofing has greatly improved since the ’60s/’70s so they hide their longevity better. Personally I find many of the current styling trends over-wrought while those cars that were new circa 2000 tended to be just as aerodynamic yet with crisp with clean lines. * the 22 y.o. daughter of a neighbour has had to trade in a new leased Citroen C1 for a used circa 2005 Fiesta to save for a house deposit; she considers the Fiesta old and horrid, but cheap. I moved to SoCal from the Midwest in 1981, and after the three day cross-country drive (in the days of the national double nickle – blah) the day I drove into town (March 31st, sunny and 75 degrees, woo hoo) I thought I had just missed a classic car show or a parade or something. There were 15+ year old cars driving around all over the place that still looked almost new. I soon figured out those were daily drivers and such a thing wasn’t unusual in “the land automotive time forgot”. In 1981 it was very unusual to see 15 or even 10 year old cars still doing daily driver service in the Midwest. In 1985 I moved back to the Midwest until 2017, when my post-retirement self returned to SoCal. The difference between now and 1981 is interesting. It’s still very common to see cars in daily driver service here in CA that are 20 years old or more (1990s models), but the difference between here and back east isn’t nearly as striking as it was in ’81. Vehicles built since the ’90s last a lot longer and tend to not die of the tin worm like they did prior to about 20 years ago. In fact, I left my semi-retired fourth-string car with family in the Midwest when I moved back to the west coast. It’s a ’95 model, still going strong at 195k miles, and still doing DD service in the family. That’s the equivalent of a 1956 car still doing DD duty in ’81, which would have been very rare even in CA. 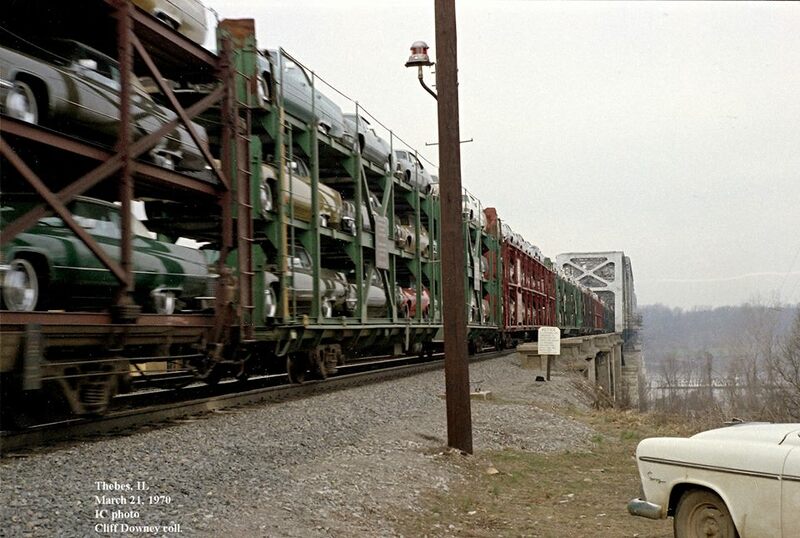 In the late summer and early fall, seeing cars on a train was sometimes a way to get a sneak preview of the new models before they officially came out. Based on the title, I was expecting a can opener incident. This is much nicer to see. Fun to see this, Jason. In my 1970s OH world, you rarely see a ’55 anything as a DD, though those train carriers were everywhere. Interesting though that they’d put the full wheel covers in the trunk but leave the poverty caps on the other cars like on the bottom row matador and middle left Pacer. They’d be less vulnerable to damage in transit. When I had jobs which involved receiving car deliveries, sometimes plastic wheel covers were in the trunk but alloy wheels would be unprotected and have the center caps in place. Later, many cars came with disposable plastic discs covering the alloys. (And foam and plastic protection in various other places, if not a full cover/wrap). At the very end of this short 1962 film of Lincoln Continentals and Thunderbirds on the assembly lines at the Wixom plant it shows them being loaded onto train cars and truck transporters – no wheel covers. That’s the way I remember them arriving at local dealers. My grandparents lived on a main north-south rail line in WVa until the 1980s. I spent at least a week down there every summer as a kid in the ’60s and early ’70s and an entire month in the summer of 1970. Being a car guy even back then, I loved seeing the southbound trains coming from the auto factories of Ohio and Michigan, pulling long strings of car haulers loaded with new cars and pickup trucks of every Big Three make and model and every color of the rainbow (empty coal cars and full auto haulers going south, full coal cars and empty auto haulers going north). We kids would hear them coming and run to the front yard and wave to the trains as they went by, usually getting waves and/or a horn toot from the engineers in return. As in the photo above, the auto haulers back then were all wide open and the new cars completely uncovered and visible. Even back then I wondered what they did about damage from rocks and etc. As for the wheel covers, I remember in the fall of ’64 going to the dealership with my dad to pick up his new ’65 Belair which he had ordered weeks before. When we got there the salesman walked us back to the new car prep area in the service department and there she was in all her glory, waiting for final prep with her wheel covers in boxes in the trunk and her interior covered in plastic. Things hadn’t changed much by 1981 when I bought a new Caprice that was just a couple of hours off the truck and still in its shipping configuration, wheel covers and floor mats packaged up in the trunk and the seats covered in plastic. They prepped it while we were doing the paperwork and I drove her home. I tend to buy used and keep them for a long time these days, so my last brand new car (so far) was in 2003 (I still have it). It was right off the truck too, parked in rows of about 50 that had just come to the dealership from the factory. By that time they were shipping them covered in white clingy plastic with Styrofoam blocks stuck to the sides to prevent dings. Wheel covers were pretty much a thing of the past by then so only the floor mats were in the trunk.